PAGLINA STRAW BRAID SKEINS, imported from Switzerland, and parisisal straw cartwheels, imported from China. Wayne Wichern has a lot of heads. He does not know the exact number, but it is more than a thousand, he estimates, divided between three studios. The cozy tribe greeting visitors to his suburban Seattle studio is comprised of four to five hundred of the sleek wooden forms, all about the size of a human head and all suggesting anthropomorphic sculptures, as though Constantin Brancusi decided to carve a village of people, leaving the details of bodies and faces to your imagination. WICHERN using the Singer cylinder arm sewing machine to sew a head-size ribbon into the hat. Photograph by Jason Wells. Wichern is a hatmaker and the heads are hat blocks, the essential building units of traditional hatmaking. To make classic shapes, such as fedoras, using couture quality hat materials, like wool felt or parisisal straw, you need hat blocks. Wichern has spent thirty-two years collecting the blocks and they have been his constant companions as he has built a career as an artisanal hatmaker. A former ballet dancer whose interest in costuming led him to hatmaking for theater before leaping into couture millinery, he is happy to report that today hats are very much in style. Wichern makes individual hats, by which he means handmade hats that are an elegant mix of traditional craftsmanship and contemporary attitude, often made for a specific customer. He makes such classic shapes as cloches, which are bell-shaped and suggest the 1920s or 1930s, and skimmers, which have crisp, flat-topped crowns and flat brims. He makes toques, turbans, fedoras, toppers, and hats whose large, outrageously swirling brims resemble crashing waves. He makes evening hats with names such as Wicked, Dahlia and Evening Rose. 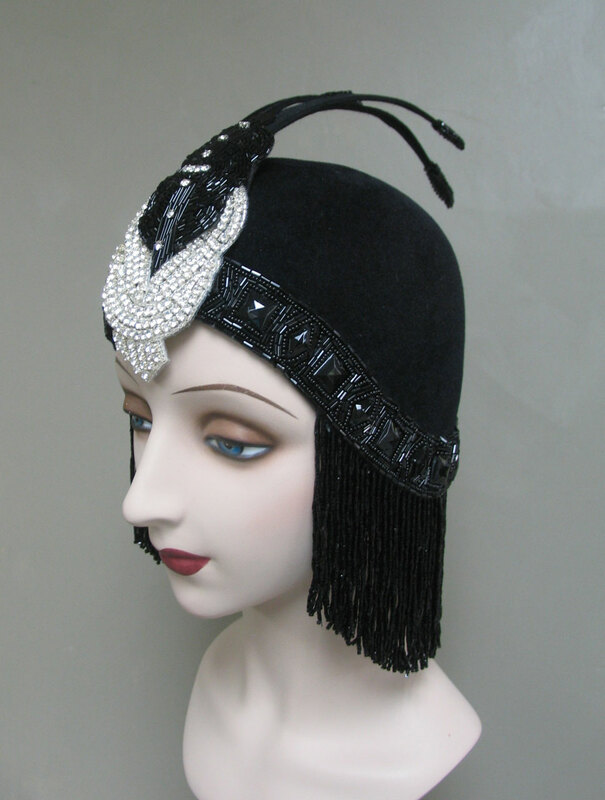 Any one of his black evening hats would transform the shyest wallflower into a femme fatale. 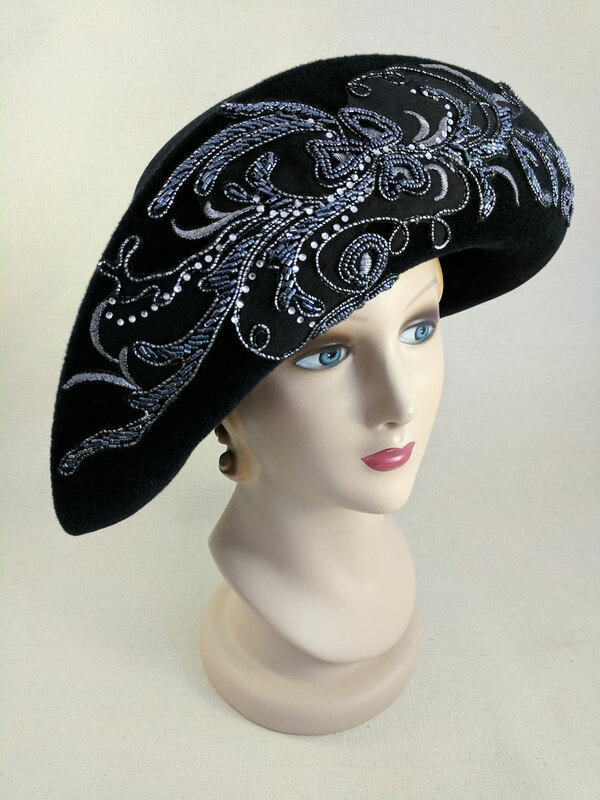 Not long ago he created a skull-hugging black velvet cloche trimmed with fringes of dangling beadwork for a client with a taste for dramatic fashion. More beadwork rises like an opened fan at the front. Cleopatra could have worn such a headpiece to seduce any of her Roman paramours. ANASTASIA of sage parisisal straw, dupioni silk, silk and velvet magnolia, and vintage silk veiling, 2010. Wichern makes hats on a speculative basis, hoping someone who drops by his Burlingame, California, studio will find one they like. He also holds trunk shows and participates in millinery and craft shows. Early in his career he made hats on a wholesale basis for small manufacturers, and he has made hats for millinery boutiques. But his favorite projects come from regular customers, some of whom commission him on a seasonal basis and for special events. “I have clients I just love. One is prone to bringing me bags of goodies. It could be a bit of fabric salvaged from the hem of a favorite dress. She wants to collaborate. It’s great. She presented me with a particular challenge when she brought me some beadwork that was white with a gold border, two pieces about eight inches each in length and triangular. They had been a neckpiece on something, and she wanted me to use them in a hat. She’s very much about telling me to do what I need to do. I thought and thought, couldn’t come up with anything, and was going to give the beaded pieces back. 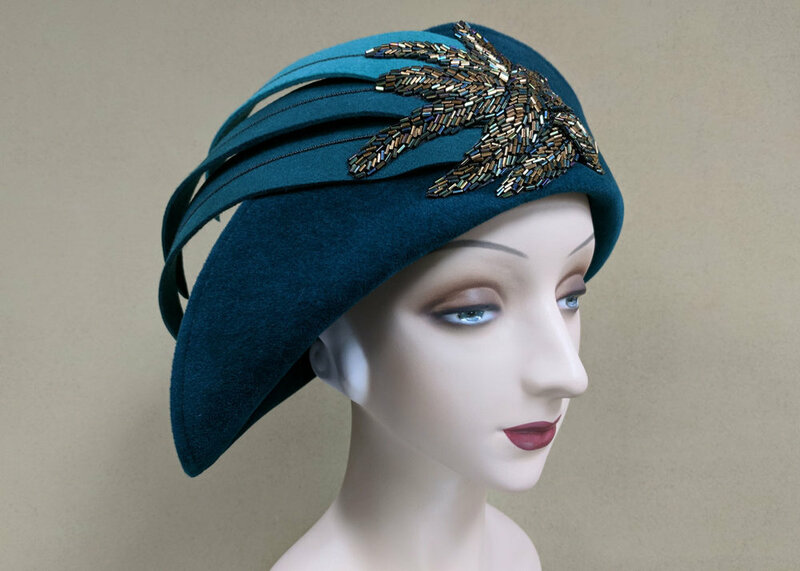 But then I started playing around with them, and sometimes something magical does happen.” The resulting chapeau is a cream wool felt cloche nearly hidden by the two beaded collars, which Wichern draped over the felt to make a turban shape. As a final touch he added a six-inch gold tassel from his vast trim collection. 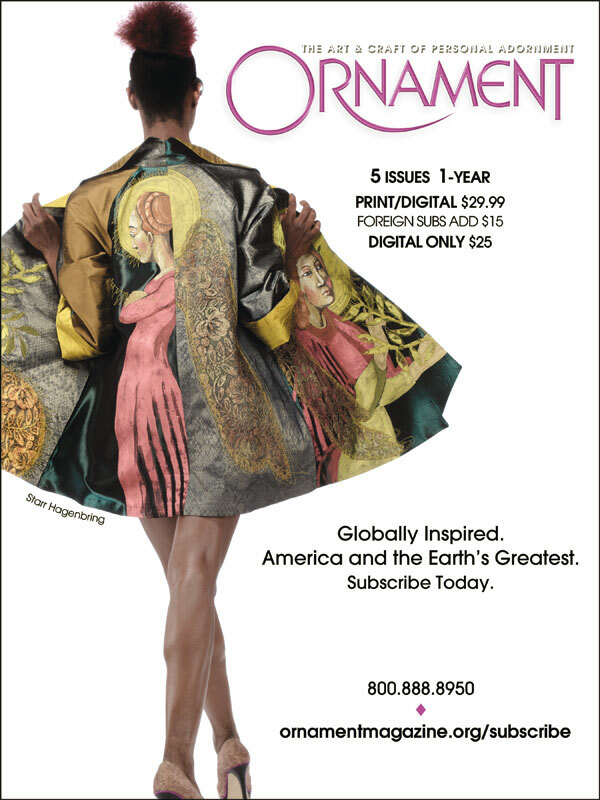 “My customers are people who have a sense of style,” Wichern says. “They are mature enough to know what to wear. People who buy my hats are people with experience. Most people who come to me are dedicated to hats, whether it’s for a special occasion or just to wear.” People who buy his hats are also women. The men’s hat market is entirely different, Wichern says, and would require different hat blocks and different types of felts. “When a man asks me if I would make a man’s hat, I usually tell him that if there’s something you really can’t buy commercially, maybe a bicorne, I’d be happy to work with you. But men’s hats are different, and you can’t be everything to everyone.” Wichern himself wears what he calls “low-key men’s shapes and berets,” none of which he makes. Wichern creates hats the way professional milliners always have. He buys felt or straw basic hat shapes, called “cartwheels”, from commercial millinery suppliers, then molds them over hat blocks into an infinite number of sizes and styles. Because the brims and crowns of the blocks separate, he can create unique silhouettes by mixing and matching crowns and brims. The felt is wool or rabbit. The parisisal straw is from the sisal plant, and is the standard material for couture straw hats because it is finer than other straws and can be molded into more complicated shapes. WICHERN blocking a felt body over a wood hat block; the final task is using the compress tool to press the felt into the recess detail carved into the block. Making a hat is surprisingly physical. Millinery ateliers conjure images of artisans adjusting silk flowers on romantic, feminine styles. But hatmaking requires physical strength and an ability to work with high heat. To mold either felt or straw Wichern applies moisture to the material. For felt, he also needs the extreme heat produced by an industrial steamer. The moist hat forms then are tied down tautly with cord at the crown and the brim to create the basic silhouette. When Wichern demonstrates this he throws his shoulders, arms and hands into knotting the cord. Depending on the style, the hats also must be sculpted by hand, in the manner of a ceramist shaping a hunk of clay. If styles have areas that curve in and out on the crown, creating those shapes requires pressing removable parts of the block back into the felt, and tying or tacking that down as well. By happy coincidence, Wichern’s youth as a Wyoming farm boy followed by years of ballet training appear to have prepared him for the physical rigors of hatmaking. When the hats are dry the next day, they are removed from the blocks, a process that can require a little wrestling. Wichern cuts excess straw or felt from the brim, finishes the brim edge on one of his several sewing machines, and sews a sizing ribbon into the inside crown. He then trims the hat, which could mean anything from sewing silk flowers to the brim to creating leaves and feathers out of salvaged bits of trimmed felt or straw. He saves every scrap of excess material to be repurposed into trim. He also collects beads, feathers, braid, ribbons, scraps of luxe fabric, silk flowers, bits of costume jewelry, and just about anything that might someday be useful as trim. In his Seattle studio he has turned a small bathroom into his trim room, and even the shower stall is stuffed floor to ceiling with plastic storage boxes filled with trims—an Ali Baba’s cave of adornments. By 1985 the life of a professional dancer with its constant travel had lost its allure, and he moved back to Seattle, where he made hats for professional theater companies and worked in visual merchandising for what was then Seattle’s most prestigious department store. He found studio space and decided to learn all he could about couture millinery. He began taking classes from John Eaton, a milliner who had been one of Seattle’s most successful hatmakers in the mid-twentieth century, a time when no well-dressed man or woman attended a formal event without a hat. “John was retired by then and was giving classes casually in his basement. Then, at the point where he could no longer teach, he suggested I buy his stuff, so I did, and dragged it all over to my studio.” Eaton’s blocks were the beginning of Wichern’s collection, though he has added many hundreds since then via eBay and other internet sales sites. “Blocks have a way of finding me. People will be cleaning out grandma’s attic and find a few, and they find me on eBay. Over the years I’ve also purchased hundreds at a time when hat factories close or go offshore. I’ve sold off a lot, since I end up with duplicates.” His oldest blocks are from the 1930s, though many are newer. They have all become more precious as hat block production in the United States has nearly vanished. Most hat blocks today are manufactured in England or Australia. WICHERN Studio and classroom in Burlingame, California, Museum Studios, Peninsula Museum of Art. LOREDANA SWIRL STRAW of raspberry parisisal straw, silk and rayon brocade fabric, 2006. For now Wichern’s career is at full throttle. But he is in his sixties, and looking ahead to what might eventually become of his block collection and his antique tools, such as his very old Willcox & Gibbs machine for sewing hemp straw braid into spirals for certain types of straw hats. His hats are included in the collections at the Fine Arts Museums of San Francisco and in the Museum of History and Industry in Seattle.